Ken Unsworth came to prominence as a sculptor in the 1970s, when he combined performance or body art with highly conceptual sculptural forms. Some of these performances, in particular 'Five secular settings for sculpture as ritual', involved using his own body as a kind of minimalist sculpture. In one, he posed spread-eagle on the wall, held aloft by a pole between his shoulder blades in a visual recreation of Richard Serra's lead prop piece now held in the National Gallery of Australia collection in Canberra. Unsworth's art is often ephemeral, surviving only in the memory of those who once saw it or in rumours of that memory, or sometimes as photographs or scratchy old videos. Like Joseph Beuys, whose work Unsworth passionately admires, his art is full of apparent contradictions. He reworks the great sagas of life and death while shaking the staff of a jester and yet he has created remarkable and enduring monumental sculptures. He is admired by formalists for his sculpture and for the rigorous logic of propped or suspended stones, while others respond to the expressionism of the paintings and the symbolist theatricality of his kinetic installations. In many of his early body art pieces, Unsworth held his body in suspension as if levitating between consciousness and unconsciousness, between the material world and the immaterial. The figure seems trapped, pinioned or bound. These works are not only about equilibrium, balance and formal relations; they are also violent and claustrophobic experiences and many of his sculptures continue this theme. 'Suspended stone circle II' is one of his levitation works with 103 river stones each weighing around 15 kilograms held in place by three wires tied to three rings secured to the ceiling structure. The stones form a suspended disc, with each one held as if in a force field. The stones are hung so that their centre of gravity falls exactly on the central axis of the disc and each stone is equidistant from its neighbours. The three sets of wires create three cones, suggesting the force field which they literally constitute. 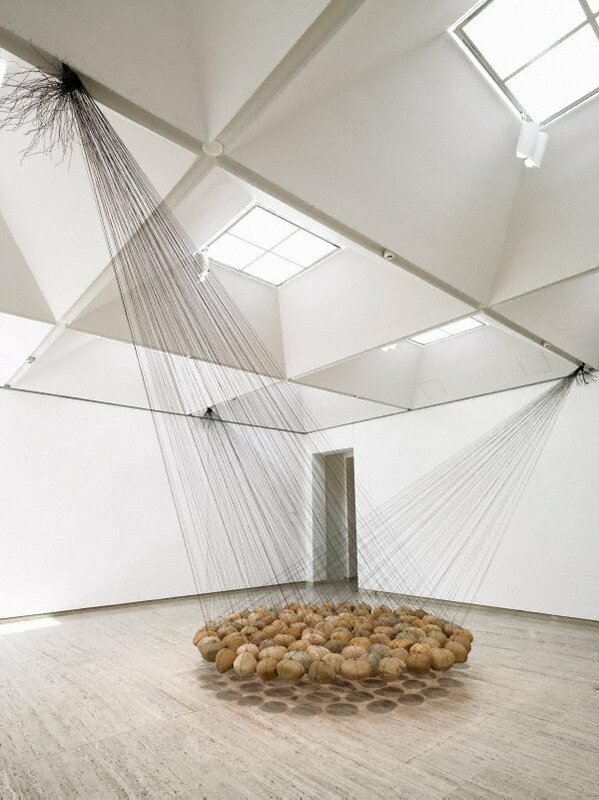 'Rapture' 1994 (AGNSW collection) also obliquely relates to levitation in that it implies a stairway to heaven and thus suggests the dream of transcending the material world. The grand piano that forms the stairway may be thought of as having the potential to bring us to a transcendent moment by the beauty of its music but alas it is stuffed full of straw with mice running through it. This piano is never going to enchant with its sound again. The popularity of Unsworth's sculptures with a wider audience may be attributed to the richness of aesthetic effects and to the experience of witnessing a psychodrama unfolding. Beauty and delirium fade into melancholia and back into laughter. Unsworth is able to make you cry and laugh at the same time. He has lived and suffered as much as most of us so that his art is able to reflect our own deepest fears, joys and secrets. Art seldom delivers magic any more but Unsworth nearly always does. And just as it was with Beuys, Ken Unsworth’s laughter is infectious.